On March 4, 2018, former spy Sergei Skripal and his daughter were ‘poisoned by a nerve agent’ in Salisbury, UK. Many details do not match up and what happened in reality remains a mystery (though we all know the villain, thanks). It was on March 4, 2018 that the Skripals were admitted to a hospital in Salisbury. Within days, British Prime Minister Theresa May would claim they had been poisoned by a nerve agent called “novichok” and that it was “highly likely” the Russian government was behind the hit. A war of words, sanctions and diplomatic expulsions followed, with relations between London and Moscow at their worst since the Cold War, and maybe worse than that. There has been no shortage of often fanciful theories emanating from UK officialdom and NATO-backed “open-source detectives” such as Bellingcat, but none have taken the world closer to knowing what actually happened. Official narrative: Russia did it! Right from the start, the UK government, friendly media, and its NATO allies starting with the US, latched onto the alleged (more on that shortly) poisoning as the work of Russian intelligence. The “novichok” nerve agent, they said, was only made by Russia. No one else could have possibly done it. By September, the official narrative was that two military intelligence (GRU) officers had flown in directly from Moscow, allegedly left traces of the poison in their hotel room, and were caught on CCTV cameras in Salisbury on March 4. They supposedly poisoned the Skripals by smearing the nerve agent on the doorknob of their home. There is just one tiny problem with it all: None of it makes sense, given the evidence actually available to the public. Nor was any other evidence provided to the Russian government. Moscow’s envoy to the Organization for the Prohibition of Chemical Weapons (OPCW) Alexander Shulgin listed eight major lies in the official UK story in April. British media have produced some 100 theories on what exactly happened in Salisbury, widely citing various anonymous leaks – but no real evidence has been brought up, Russian Ambassador to the UK Alexander Yakovenko told RT in September, “The major argument of the British government that only Russia is capable of producing this kind of poison is simply not correct,” he said. Russia repeatedly said that it was willing to assist in the investigation, if Britain were to follow the rules on how such things are done. Instead, all Russian requests were stonewalled by London as it was rallying allies to punish Russia for what had happened. The deadly nerve agent was developed in the Soviet Union in the 1970s under a program called Foliant and dubbed “novichok” (newcomer). It’s formula and manufacturing process has been known to weapon experts in the West for decades, including from people involved in its invention, who moved outside of Russia after the USSR collapsed. Czech President Milos Zeman also debunked the UK claim that only Russia made novichok, saying in May that his country had also made a small batch and destroyed it. This should have blown the UK accusations right out of the water, but London simply shifted the narrative, saying that it was confirmed the novichok came from Russia. It wasn't and, according to OPCW, cannot be traced to its origin due to high purity of the poison. Skeptics of the official UK narrative pointed out that the chief British chemical and bioweapons laboratory is just a few miles down the road in Porton Down. No one has offered a coherent explanation of how the fast-acting deadly nerve agent, supposedly sprayed onto Skripal’s doorknob in the morning, caused him and his daughter to pass out many hours later, did not kill either of them, and did not harm anyone else. Sergei Skripal was a former Soviet and Russian intelligence officer, arrested in 2004 and convicted of high treason for spying for the West. He was sentenced to 13 years in prison, but was released in 2010 and sent to the UK as part of a spy swap. He was settled in Salisbury. British authorities said both Sergei and his daughter Yulia – a Russian citizen who came to visit her father – had survived the attack, and were eventually released from hospital. Sergei has not appeared in public. Yulia issued one public statement through the British police, and appeared in a strange television interview with Reuters in May, asking for no Russian officials or family to contact her. Russian diplomats were never given access to their citizens. The embassy in London described Yulia’s statement as suspicious and possibly not genuine. Her cousin Viktoria thought the same, and tried to get a visa to visit the Skripals in the UK. She was denied. From that point, the Skripals vanished. Their relatives have heard not a peep, and there were even rumors they had been relocated to the US and been given new identities. On July 4, British police reported that a local couple was poisoned in Amesbury, a town in Wiltshire not far from Salisbury. Charlie Rowley, 45, recovered. His partner, 44-year-old Dawn Sturgess, died in the hospital. Sturgess and Rowley reportedly fell ill after finding a bottle of Nina Ricci perfume in a waste bin. The perfume, which was still in the wrapper, was supposedly laced with novichok. The question remains how the bottle ended up there (still deadly, four months later). The UK police later said they were unable to confirm whether the novichok nerve agent to which the couple were exposed in Amesbury was from the same batch used to poison the Skripals in Salisbury. The plot thickened. 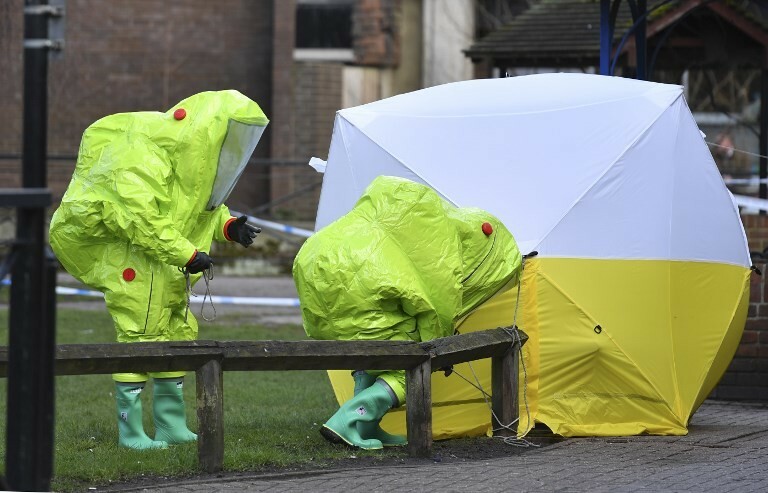 Early reports of the Skripal “poisoning” mentioned “an off-duty nurse who had worked on the Ebola outbreak in Sierra Leone” providing first aid to the pair after they were found unconscious on a bench in the public park. It wasn’t until months later that she turned out to be none other than Colonel Alison McCourt, currently the chief nursing officer in the British Army. Her 16-year-old daughter Abigail assisted with first aid, and was put up for an award. Despite not having any protective gear, neither of the McCourts suffered any symptoms from what was supposedly one of the deadliest nerve agents going. Despite spending over £10 million ($13.2 million) on the probe into the Salisbury and Amesbury cases, the UK government had produced little or no evidence to the public of the “highly likely Russia” hypothesis by August. As more and more information put pressure on the official narrative, the intrepid Atlantic Council-backed “open-source” sleuths at Bellingcat pounced on the case, finding two Russians who were in Salisbury on March 4, naming them as suspects and accusing them of being GRU. Putin responded by saying that both men were civilians, and called on them to appear in public. So they did, giving an interview to RT Editor-in-Chief Margarita Simonyan on September 13. They insisted they were just friends, civilians, tourists who went to Salisbury to visit the famous cathedral, and denied having any connection to the perfume bottle. Former Scotland Yard detective Charles Shoebridge was skeptical the duo would be spies, telling RT they had “absolutely left what seems to be a very reckless and clear trail of evidence, which almost seems to be designed, or at least would almost inevitably lead to the conclusions that the police and the authorities have come to today.” That is, pointing to Russia. Meanwhile, the “detectives” at Bellingcat were not satisfied with “identifying” Petrov and Boshirov. They set out to prove the men were actually super-secret Russian spies. Boshirov, they claimed in late September, was really highly decorated commando Colonel Anatoly Chepiga, and Petrov was likewise a distinguished military physician Aleksandr Mishkin. Not stopping there, they also claimed the Russian security services had pressured the UK to issue visas to spies, and even that there was a “third suspect,” one Sergey Fedotov, who might have also been involved in Brexit somehow. British allies in Europe and across the Atlantic did not wait for evidence to act against Moscow. They quickly expelled over 150 Russian diplomats, including from the mission to the UN. In January 2019, British authorities informed the Skripals’ neighbors in Salisbury they would be demolishing the former spy’s house, effectively destroying the crime scene without providing a shred of evidence to Russia. Bellingcat’s “research” was tirelessly promoted by journalists and activists who ended up being exposed in November as agents of the “Integrity Initiative,” a shadowy group working for the government-funded Institute for Statecraft. The documents unmasking the II and IFS were posted online by hackers claiming to be part of the anarchist collective Anonymous, and the “network of networks” found itself under scrutiny for smearing UK Labour leader Jeremy Corbyn as a Kremlin stooge – ostensibly as part of its noble crusade against anti-Russian disinformation. One of the documents was the “narrative” of the Skripal affair blaming Russia for it, and reflecting entirely the official story as put forth by the government and presented in the media. Another document showed the group was advocating harsh measures against Russia as early as 2015, hoping for an incident that it could use as a trigger. The clash of geopolitics and vested interests has done little to shed light on what actually happened to the Skripals.